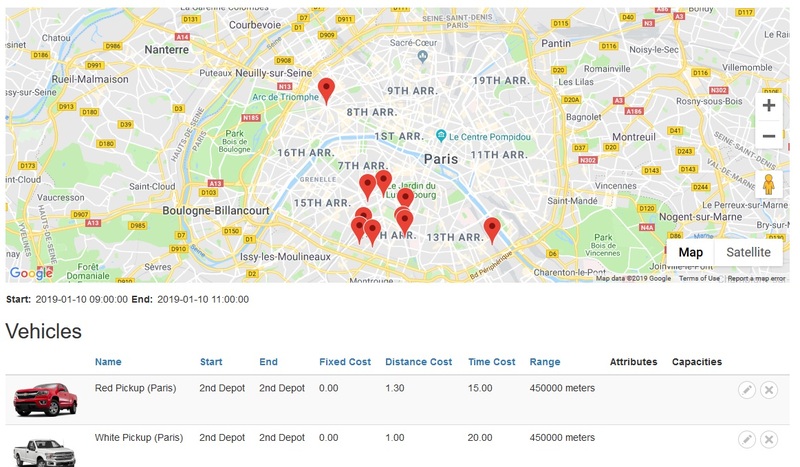 Real world route planning must take into account a range of costs associated with your fleet of vehicles in order to accurately portray optimal solutions based on the specific characteristics of that fleet. Any system that only takes only distance or time into account (but not both) is not going to be able to calculate the best possible solutions because it is ignoring half of all your cost generators. Route through town: Slow, but shorter distance. 15km, taking 1 hour. Route on highway around town: Fast, but longer distance. 40km, taking 30 minutes. Route through town: 15km x $2 + 1 hour x $15 = $45. Route on highway around town: 40km x $2 + 1/2 hour x $15 = $87.5. Clearly the highway around town is far more expensive in real terms. However, time only based route optimizations will always select the highway around town because it is faster (and therefore appears to be cheaper when only time based costs are considered). The converse argument is also true for optimizations that only consider distance costs. Fixed Cost: Any cost associated with actually using a vehicle in a solution. A good example might be rental vehicles that require an upfront booking fee before they can be used. Distance Cost: Per kilometer fuel costs, along with wear and tear, can all be thought of as distance related costs. The further your vehicles travel, the more often they need to be serviced and maintained. Time Cost: Employees (i.e. drivers, and other staff) have an hourly cost associated with their labor that must be taken into account. Now, as it turns out, there will be occasions when other factors, such as time based constraints or delivery capacities come into play. In these instances a more expensive trip between two locations might be selected in order avoid situations that would drastically increase the overall cost of the entire solution. For the purposes of this article, however, we're going to focus solely on seeing how different costs lead to significantly different solutions without worrying about extraneous details. There are any number of scenarios where it helps to use as few vehicles as possible in order to save money (as opposed to using as many vehicles as available in order to finish as early as possible). One example might be a basic minimum paid to drivers who are required to come into the depot - regardless of how long they drive for. Another might be payments for rental vehicles required to meet all your delivery/pickup obligations. The Red Pickup costs $40 to make use of and the White Pickup costs $50 to make use of. All other things being equal, with distance costs set to $1 per kilometer and time costs set to $15 per hour, if we are able to use only one vehicle then it should be the Red Pickup since this will save us $10. This result seems fairly straightforward, but it leads to some pretty powerful solutions in more complex examples because it isn't simply saving you $10, it's also telling you how many vehicles you actually need to complete the schedule. This is useful when you are dealing with 50 vehicles and find that you actually only need 40. Instead of growing your fleet to meet demand it may be possible to shrink it. So the White Pickup was used exclusively because it is cheaper to run. So far so good. In this case it might be a bit harder for you to predict the outcome of the solution because each vehicle may be cheaper to run under different circumstances. In addition, the distance cost of the Red Pickup is 30% more, but the time cost of the White Pickup is a touch over 33% more. This might hint to you that, overall, the White Pickup might be slightly more expensive to run, depending on the ratio of distance to time the solution has. Is this a surprising result? It's easy to check what the cost would have been if the White Pickup was used by calculating $28.45 x $1 per hour + 2.51.11 x $20 per hour = $85.50. Using the Red Pickup saved us around $6 even though it is more expensive per kilometer. This is a great result because it shows how the Red Pickup utilized its full quota of 2 hours (literally to the minute) because it is far cheaper on a per hour basis. The White Pickup on the other hand is far cheaper on a per kilometer basis so it ended up driving a longer distance even though it spent over 20 minutes less on the road overall. While this example only involves 2 vehicles you can see how powerful the results can be when you take into account all the real world costs associated with your vehicles. What you can be sure of is that super lightweight and cheap vehicles will be utilized to the maximum benefit of your bottom line, while more expensive vehicles will be used far more sparingly and only when necessary in order to keep costs down even further. Long story short. So long as you accurately capture the costs associated with using your vehicles (regardless of whether they are cheap or expensive to run, drive, and maintain), Optergon will ensure your overall costs are minimized.